Motorcycle accidents frequently end in serious trauma or fatalities. Motorcycles do not offer any protection to their riders, especially in an accident. The most common cause of motorcycle accidents is a collision involving a motor vehicle, i.e. a car or truck, and a motorcycle. This can occur when the driver of the other vehicle fails to check his or her blind spots or misjudges the speed of a motorcycle before changing lanes or making a left turn. 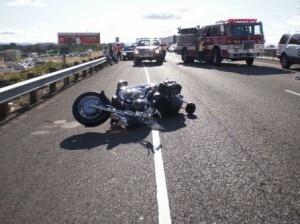 Another common cause of motorcycle accidents is when a vehicle suddenly stops. Such a sudden stop may cause the motorcyclist to collide with the rear of the vehicle or to topple over the motorcycle even without contact with the other vehicle (even if the motorcycle has suddenly stopped, the motorcyclist may continue in motion). Although rear-end collisions usually result in minor injuries, for motorcyclists, such abrupt stops can cause the motorcycle to flip or throw the rider off the motorcycle, resulting in serious injury. Motorcycle accidents may also occur during lane splitting. This is when motorcyclists travel between two lanes of stopped or slow moving vehicles, usually during dense or heavy traffic. Injury may result if the motorcyclist is too close to another vehicle or if the driver of a motor vehicle does not anticipate that any vehicle or motorcycle will be passing him. A driver may also quickly change lanes, not anticipating a motorcycle passing him between the two lanes. Road conditions may also cause motorcycle accidents. Poor weather conditions, uneven pavement, road construction, the presence of gravel or even the smallest debris, and potholes can all lead to a motorcycle slide, skid, and/or topple. Obtaining compensation from insurance companies and/or the at-fault party can be extremely stressful, especially when the motorcyclist has been seriously injured or has died. Who is at fault for an accident involving a motorcycle may be highly contested, especially if other factors are involved, e.g. the biker was speeding. Newport Beach motorcycle accident lawyers know how to conduct an investigation to determine who is at fault and whether the motorcyclist has a percentage of fault. This investigation may include obtaining a police report, questioning witnesses, and retaining experts to reconstruct the accident. Since most motorcycle accidents result in serious to fatal injuries, many insured motorists may not have enough insurance coverage or assets to adequately compensate the motorcyclists. Newport Beach motorcycle accident lawyers know that if you have uninsured/underinsured coverage and the other party is at fault, then you are entitled to compensation from your own insurance company (note: motorcyclists are required by law to carry motorcycle insurance, which is separate from your auto insurance). Newport Beach motorcycle accident lawyers will also investigate other avenues for obtaining relief, such as whether the motorcycle was defective or whether a public or private entity had notice or knowledge of a defect in the road that caused the motorcycle accident. Contact Russell & Lazarus APC, Newport Beach motorcycle accident attorneys, at 949-851-0222 for legal advice about your claim.